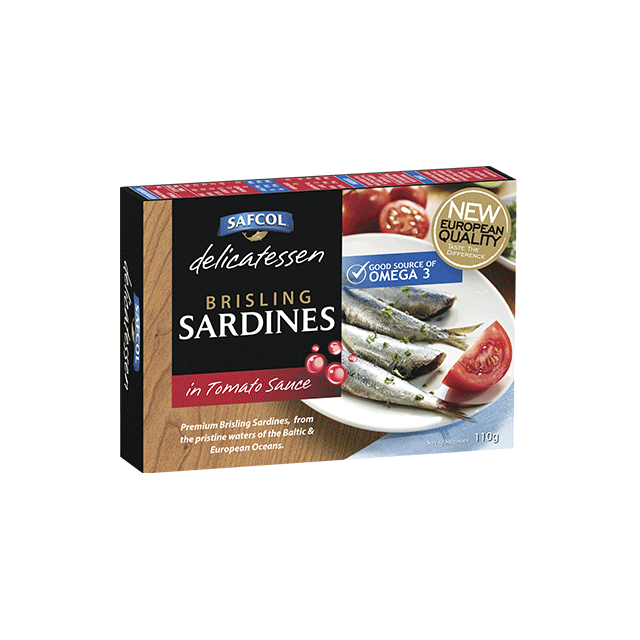 Safcol Brisling Sardines in Tomato Sauce is from the pristine waters of the Baltic & European Oceans, Good source of Omega 3. Safcol Brisling Sardines – the ‘Superfood of the Sea’ – come to you from the cool, pristine waters of the Baltic & European Oceans. They are expertly prepared to lock in all the nutritional goodness of nature, so they are not only delicious but also brimming with Omega 3 Oils and Protein. Enjoy them on multi-grain toast with thinly sliced chilli peppers for a healthy flavoursome snack in a snap. It’s all you would expect from the Seafood Experts. Ingredients Brisling Sardines (60%), Water, Tomato Paste (14%), Salt, Vinegar, Thickener (Xanthan Gum).